Homeowners who have decided to make the switch to solar energy are often extremely excited to have their solar panels installed. They are ready to move off the grid and start producing a renewable source of energy. However, there are a lot more decisions to be made before you have your solar panels installed. You should be prepared to do a lot of research before you decide on which panels and which contractors are ultimately right for your home’s needs. Before you have your solar panels installed, here are a four of the top questions you should be able to answer for yourself. Can your roof support solar panels? Knowing whether your home is properly positioned for solar panels can be one of the biggest deciding factors for installation. 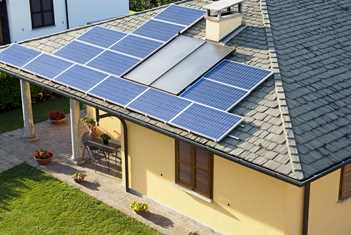 A home that receives mostly shade throughout the day may not stand to gain much from solar panels. You will have to work closely with your solar energy company to ensure that the price of the panels is offset by the amount of electricity they can reasonably generate for your home. What type of system works best for your home? Not all solar panels are created equal. You will need to do a little research on what type of system is going to suit your home the best. For example, you might need solar panels that can fit inside of a smaller budget or panels that can contribute back to the grid. Many people opt for photovoltaic panels on the rooftop, but your installation company may have a different recommendation. Should you buy or lease your panels? You might be faced with the option to either purchase your panels outright or to lease them from your company. Both options have their advantages, but the right choice for you will depend on your unique situation. Purchasing your system will require a much greater initial outlay of funds but you will then own your own solar energy panels. Leasing requires less money upfront but with fewer long-term benefits. Take some time to discuss both options with your financing team before making a final decision. Some homeowners attempt to install their own solar panels on the roof, but this can end in disaster. Instead, you should look for installers that have experience and a great reputation in the local area. Request references from other homeowners who have used their services already. You may even look for trade organizations that certify installers such as the North American Board of Certified Energy Practitioners. This organization and others like it can give you some peace of mind that your installers have received training from an accredited agency. Knowing the answer to these four questions can help you to make a wise decision before your solar panel installation. It might require a little more research, but it will ultimately be worthwhile. When you’re ready to move forward, you can contact Powertec Solar for all of your high-quality solar panels and installation services!